"We appear to be in a meandering sort of direction," said Reis economist Ryan Severino. 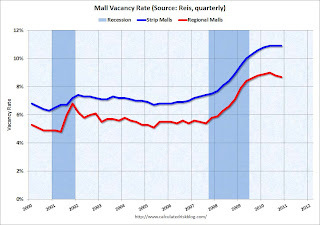 At regional malls the record vacancy rate was 9.0% in Q2 2010 (Reis started tracking regional malls in 2000). The record vacancy rate for strip malls was in 1990 at 11.1%. It appears both the mall and office vacancy rates have peaked (or are near a peak), but the rates are still very high - and it will take some time for the vacancy rates to come down enough to start building again.